I think he’s buried in Beth David Cemetery, Elmont NY. 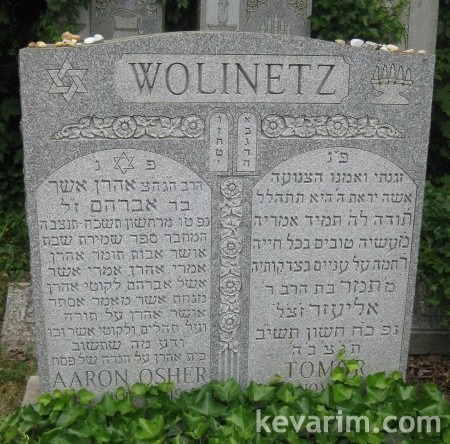 According to the Antopol yizkor book Rabbi Wolinetz did not carry an official Rabbinical title, he was a Lamdan and Talmud Chochom and authored Seforim. I am Aron Asher Wolinetz’s grandson. I have had translated and published 5 volumes of his works, Pirkei Avos (Treasuresof the Fathers), Akdamos and Megillas Ruth (Shavuoth Highlights), Chumash(Treasures of Aron), Tefillah (Imrei Aharon on Tefillah) and just recently The Haggadah and MaSheTashiv (The Bais Aharon Haggadah). All the English translated volumes are available from me at a cost of $18.. per book. W772@aol.com.